While case study writing may seem easy at first glance, developing an effective case study (also called a success story) is an art. Like other marketing communication skills, learning how to write a case study takes time. What’s more, writing case studies without careful planning usually results in suboptimal results. Involve the customer throughout the process. 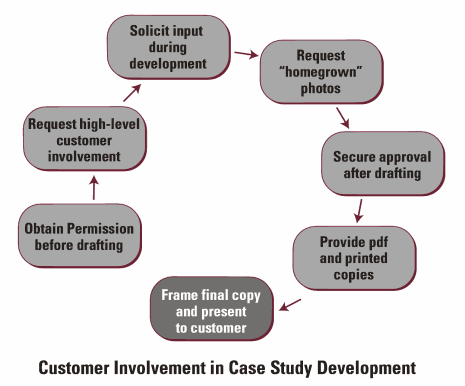 Involving the customer throughout the case study development process helps ensure customer cooperation and approval, and results in an improved case study. Obtain customer permission before writing the document, solicit input during the development, and secure approval after drafting the document. Write all customer quotes for their review. Rather than asking the customer to draft their quotes, writing them for their review usually results in more compelling material. Request high-level customer involvement. Early in the process, recommend that a high-level manager or executive sign their name to the document. Including such a name and title on the case study increases its credibility, and can benefit the manager as well, in the form of recognition for a job well done. Establish a document template. A template serves as a roadmap for the case study process, and ensures that the document looks, feels, and reads consistently. Visually, the template helps build the brand; procedurally, it simplifies the actual writing. Before beginning work, define 3-5 specific elements to include in every case study, formalize those elements, and stick to them. Start with a bang. Use action verbs and emphasize benefits in the case study title and subtitle. Include a short (less than 20-word) customer quote in larger text. Then, summarize the key points of the case study in 2-3 succinct bullet points. The goal should be to tease the reader into wanting to read more. Organize according to problem, solution, and benefits. Regardless of length, the time-tested, most effective organization for a case study follows the problem-solution-benefits flow. First, describe the business and/or technical problem or issue; next, describe the solution to this problem or resolution of this issue; finally, describe how the customer benefited from the particular solution (more on this below). This natural story-telling sequence resonates with readers. Use the general-to-specific-to-general approach. In the problem section, begin with a general discussion of the issue that faces the relevant industry. Then, describe the specific problem or issue that the customer faced. In the solution section, use the opposite sequence. First, describe how the solution solved this specific problem; then indicate how it can also help resolve this issue more broadly within the industry. Beginning more generally draws the reader into the story; offering a specific example demonstrates, in a concrete way, how the solution resolves a commonly faced issue; and concluding more generally allows the reader to understand how the solution can also address their problem. Quantify benefits when possible. No single element in a case study is more compelling than the ability to tie quantitative benefits to the solution. For example, “Using Solution X saved Customer Y over $ZZZ, ZZZ after just 6 months of implementation;” or, “Thanks to Solution X, employees at Customer Y have realized a ZZ% increase in productivity as measured by standard performance indicators.” Quantifying benefits can be challenging, but not impossible. The key is to present imaginative ideas to the customer for ways to quantify the benefits, and remain flexible during this discussion. If benefits cannot be quantified, attempt to develop a range of qualitative benefits; the latter can be quite compelling to readers as well. Use photos. Ask the customer if they can provide shots of personnel, ideally using the solution. The shots need not be professionally done; in fact, “homegrown” digital photos sometimes lead to surprisingly good results and often appear more genuine. Photos further personalize the story and help form a connection to readers. Reward the customer. After receiving final customer approval and finalizing the case study, provide a pdf, as well as printed copies, to the customer. Another idea is to frame a copy of the completed case study and present it to the customer in appreciation for their efforts and cooperation. Writing a case study is not easy. Even with the best plan, a case study is doomed to failure if the writer lacks the exceptional writing skills, technical savvy, and marketing experience that these documents require. In many cases, a talented writer can mean the difference between an ineffective case study and one that provides the greatest benefit. If a qualified internal writer is unavailable, consider outsourcing the task to professionals who specialize in case study writing.